Photo: Eddie Bowens Farm, ca. 1865, 660 Trade Hill Road, Seabrook, GA. Listed on the National Register of Historic Places in 2004. Photographed by user:Bubba73 (Jud McCranie) (own work), 2015, [cc-by-3.0 (creativecommons.org/licenses/by/3.0)], via Wikimedia Commons, accessed July, 2015. The Liberty County Courthouse is located at 201 South Main Street, Hinesville, GA 31313; phone: 912-876-3625. Liberty County was established on February 5, 1777 from portions of the parishes of St. Andrews, St. James and St. Paul. It was the 6th county to be established in Georgia and was named Liberty County because of, unlike much of Georgia, its early commitment to the Revolutionary War effort. 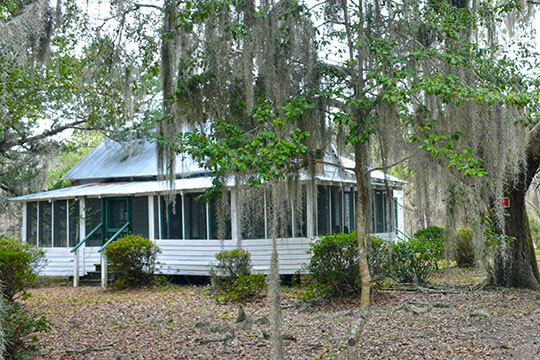 Liberty County's rich history began as it was settled in 1752 by a group of settlers belonging to the Society of Friends. This group moved south from Dorchester, South Carolina to settle in the coastal area of Georgia, halfway between the existing settlements of Savannah and Darien. In addition to the Midway settlement, the seaport Town of Sunbury was also established. This bustling port rivaled the port of Savannah, although the only remaining evidence of the original town is the cemetery. Liberty County settlers took the lead in the Revolutionary War effort, as two of Georgia's three delegates to the Continental Congress and signers of the Declaration of Independence, Button Gwinnett and Lyman Hall, were residents. Liberty County's commitment to liberty continued through the 1800's during the War of 1812 and the Civil War and into the 20th century when civil rights activists received training at Dorchester Academy. Liberty County is also home to Fort Stewart, where the 3rd Infantry Division of the United States Army is based. Fort Stewart encompasses portions of five counties in its 279,270 acres and is the largest military installation in the eastern United States. Fort Stewart is the combat training installation for both regular soldiers and reservists. Liberty County, Georgia, Consolidated Comprehensive Plan 2030: Community Assessment, Volume I, 2008, www.dca.state.ga.us, accessed July, 2015.